The Information Technology Authority (ITA) conducted the Second Survey of Information and Communication Technology (ICT) Access and Usage by Households and Individuals in 2016 as an accompanying survey with the Comprehensive Households Survey conducted by the National Center for Statistics and Information (NCSI). The data of ICT survey was collected during the period of April to August 2016. It is worth to mention that ITA carried out the first standalone survey during the year of 2013. Conducting this survey is very important to assess and benchmark the usage of ICT in the society to enhance and drive the ICT initiatives and to achieve the goals of e.Oman Strategy. This measurement also helps to benchmark Oman’s status against a number of ICT indicators regionally and internationally. The primary purpose of this publication is to enable a uniform governance, risk management and security management framework for government agencies. The secondary purpose is to provide guidance on detailed concepts and steps in transforming cybersecurity, and to align them with the existing information security strategy and processes. The purpose of this framework document is to provide guidance for conducting risk assessments for government organizations. 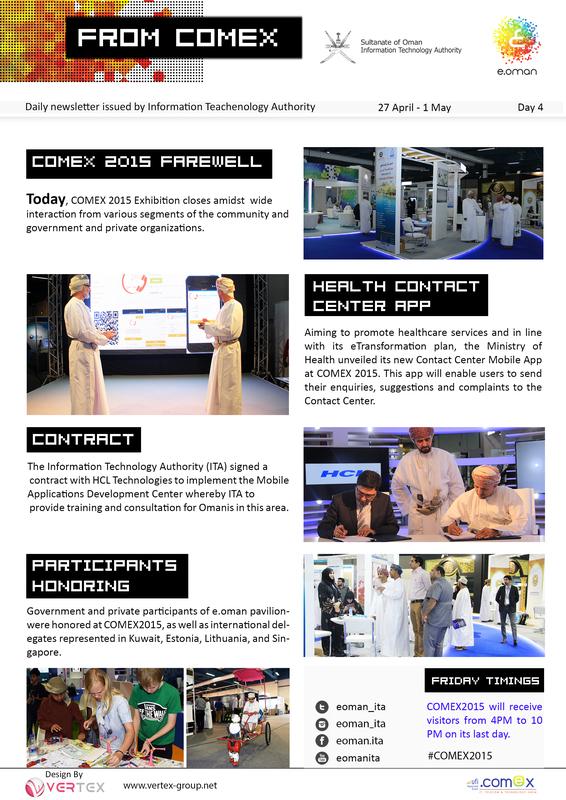 The purpose of this document is to commission governance of Enterprise IT (GEIT) across government agencies in Sultanate of Oman. The purpose of this document to assist government entities in classifying their data and information systems in accordance with Royal Decree 118/2011 on Security Classification. Security baselines for government organizations in Oman in order to provide proper security measures to safeguard the valuable information assets within the organization. A framework for adoption of cloud computing with its various implementation and service models. It lists certain benefits, challenges and risks in adoption of cloud computing relevant to government agencies of Oman. - This policy provides direction to government agencies on maintaining websites and on the adoption of cloud computing services (hosting). The ITA annual report 2017 highlights the main achievements and milestones according to the e.oman strategy pillars. The Omani law defines blackmailing as the act of threatening or blackmailing someone to get him to do the act or omission, with some form of punishment if he/she does not offer the request. The cybercrime law identified in the eighteenth article a term not less than one month and not more than three years and a fine of not less than one thousand RO and not more than three thousand RO or one of these penalties. The penalty shall be temporary imprisonment for not less than three years nor more than ten years and a fine of not less than three thousand RO and not exceeding ten thousand RO if the threat to commit a crime or breach of the attribution of moral turpitude. Sas Center for Virtual Reality has completed one year from its launch in April 2014. Whereas Sas Programme for Entrepreneurship has completed two years since its inception in March 2013. This info graph highlights the key achievements of the centers during the past years and their main services, facilities and training areas. For the first time in the Sultanate, the Information Technology Authority (ITA) conducted its survey on the 'Access to and Use of Information and Communications Technology (ICT) by Households and Individuals 2013'. The survey covered 11,000 randomly selected households across the Sultanate, taking into consideration urban and rural localities. This publication presents the survey findings and most important related information. The Sultanate’s only donation portal www.donate.om has achieved a remarkable record this year by 9389 electronic transaction entries worth of O.R. 290,642 based on the last August update by the ePayment Portal at the Information Technology Authority (ITA). Donations made for Oman Charitable Organization and Al Rahma Charity Team topped the list with donations reached up to O.R. 160.371 and O.R.76.068 respectively. ITA has conducted a workshop in Social Media as part of eTransformation project and it was conducted in Golden Tulib hotel with a number of more than 80 participants who work in running social media from government agencies. The workshop aims to highlights the importance of creating a policy and strategy of Social media and its essential usage at a government level. This workshop is part of a series of training sessions conducted for content management teams in government agencies to improve their skills in the different knowledge areas that enhance the performance of the content team in eTransformation project. Based on the recommendations and instructions of the Board of Directors of the Information Technology Authority (ITA), ITA immediately started the implementation and execution of the decisions of the Small and Medium Enterprises (SMEs) Development Symposium, which was held in Saih Al Shamikhat in 2013. This manual is Intended to summarize the “General Framework of SMEs Participation in the Tendering Process”, to clarify the procedures and mechanisms to enable the participation of SMEs in the implementation of public ICT projects. In addition, the booklet explains the mechanisms of awarding projects for SMEs, either directly or by large Corporations. The booklet also explains the facilities provided for SMEs in tendering process to contribute to the development of ICT industry. Upon the inception of the National Strategy for the Sultanate of Oman the Oman Digital Society (e.oman) in 2003 and its revision in 2010, Oman has taken concrete steps to fulfil its national and international obligations towards streamlining ICT, transforming communities and integrating societies. In this context, WSIS Action Lines have served as an invaluable framework for e.oman and provided pivotal milestones to its goals. Of particular note is the WSIS Forum and its components, which provide a remarkable opportunity to learn and exchange how common human needs are attended to in diverse human experiences. In this sense, WSIS Action Lines dovetail the MDG framework. Enormous efforts have been exerted by several governments to achieve these MDGs. This is the 1st eReadiness Report which covers the first phase towards the eGovernment Transformation Plan, that of ePresence. The Council of Ministers in its meetings during November and December 2013, reviewed the eReadiness Report prepared by the Information Technology Authority (ITA) in collaboration with a number of government agencies. The Council stressed that it is imperative that due attention and care be accorded to the eGovernment Transformation Plan by all government agencies in realizing the set goals of the Plan. Moreover, pursuant to the principle of societal participation, it is necessary for these agencies to continuously publish updated information related to quality assessment and user satisfaction measurement on their websites. This part of the eReadiness report showcases the general assessment of the Information Technology Authority’s (ITA) level of eReadiness towards the eGovernment Transformation Plan. According to the report, ITA achieved 87% in the general readiness phase, 90% in the ePresence phase and 87% in the eInteraction phase. In regard to the level of eReadiness in the eTransaction phase and eTransformation phase, ITA marked a progress of 92% and 98% respectively. More details can be found in the attached Arabic report. This paper is an introduction of the services provided by the National e-PG system, and the technical information for merchant to perform integration of their websites with the National e-PG system. The Information Technology Authority (ITA) is currently preparing its sixth annual report for 2012. This report exhibits a walk-through of ITA’s projects and initiatives which have been accomplished on various areas of focus. A number of infrastructure projects to further build the e-Oman strategy has been achieved which definitely made great strides towards meeting the objectives of the national strategy to build an Omani digital society as well as the e-government project, as illustrated by the report. Based on these guidelines, e-Oman strategy has been updated for the next five years in an attempt to pay more attention to the areas of society’s capacity development as well as enhancing the skills of individuals. This is in addition to e-government and e-services development, expansion of the information technology sector, corporate governance, improvement on standards and regulations, development of national infrastructures, and finally promotion and awareness. E-Government enables delivery of services and their consumption using a range of electronic channels. The design, development, deployment and use of these services and information come at price. The use of energy and resources for communications and computing is now abundant causing us to ensure that we care of our environment adequately. ITA as a governing body envisions a nationwide Green ICT strategy that aims to measure and control our carbon footprints through committed methods and responsible use of ICT. • Create the knowledge society of Oman in a responsible way by the efficient and sustainable use of ICT. • Realize ownership and adherence to national standard in Green Computing by establishing a wider framework for sustainable progress. • Build a balance between modernization of service delivery and conservation of Oman’s resources and preservation of its clean environment. • Promote eco-friendly behavior through best practices within the community at work as well as homes. • Recognize excellence is the delivery of electronic services with due to responsible computing and green realization through HM’s E-Government Awards. The Information Technology Authority of Oman launched the Oman Open Data portal with 55 data sets of 5 different government agencies. The portal features the vision and mission behind the portal, the related policies, data sets and a media archive. The session will also brief on the journey made to realize the first phase of this project and the future plans in the phases ahead. In the interest of the global community the Information Technology Authority of Oman, commits itself to ensure that its activities reflect environmental responsibility at its best. Environmental responsibility is the need to consider the well-being of our environment and protect the health, balance, and diversity of all human and natural resources. • Adopt and promote standards for Green-IT within the community. • Create awareness about and encourage an eco-friendly life style at work and at home. Public sector transformation being the prime focus in the agile E-Government implementation in the Sultanate of Oman, this session focuses on knowledge management and benchmarking for excellence. Such metric may involve measuring customer-satisfaction using both subjective and objective metrics. In a wide-arching scope value-based management and change management are key drivers to innovation in management that boosts government’s competitiveness and promotes excellence using best practices. • Explore policy recommendation on enhancing performance through E-Government service metrics. • Measuring e-Government and re-engineering for excellence from systems, technology and people perspectives. • Build capacity for developing user-centric e-government strategies, involving benchmarking. • Create adequate awareness within the public sector about relevant statistical concepts and encourage deep analysis discussions on how to construct and measure such indicators. Realizing the need to transform Oman into a sustainable knowledgebased society, the Sultanate of Oman through the National Strategy for Digital Oman and eGovernment set in place plans and mechanisms to achieve this goal. On the basis of this strategy, the e.oman initiative was born, leveraging information & communications technologies (ICT) designed to enhance government services, enrich businesses, and empower individuals to interact with the digital environment. The e.oman strategy aims to create an integrated infrastructure for the provision of eGovernment services for the citizens and the business sector in the Sultanate, develop a robust ICT industry, and provide various job opportunities for citizens. The e.oman strategy has since generated a number of projects that serve different segments of the society and facilitate access to a digital Oman society and eGovernment. The Innovation and Support Center is managed by highly trained and qualified professional Omanis; not only to keep pace with global development in the provision of technical support services but also to lead this development. Over the past six years the Center has proved its ability to lead the development in the area of consultancy services, project management and technical support at global levels. ITA has launched its second statistical publication for ICT Surveys conducted during the year 2012 which measure the Access to and Use of ICT in Government, Higher Education, General Education and Business Sector. 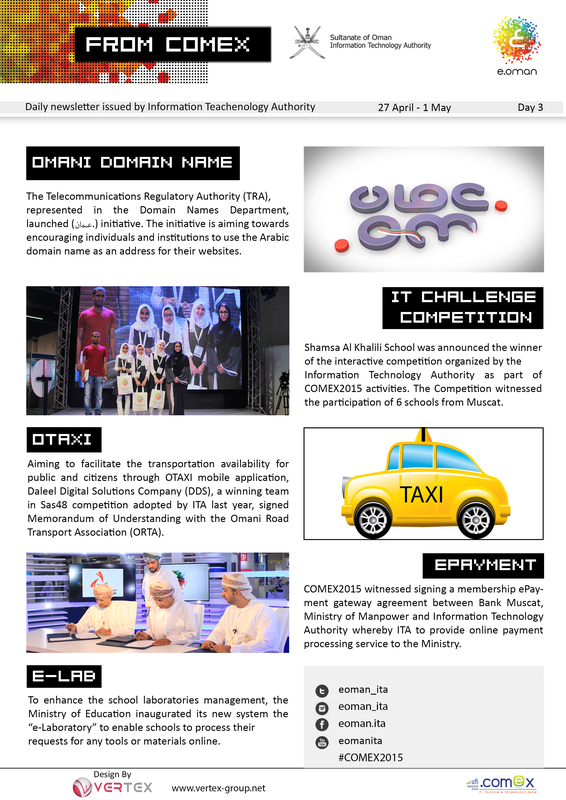 The Information Technology Authority (“ITA”) Annual Report for 2011 presents the achievements accomplished so far in the implementation of the National Strategy for Oman’s Digital Society (“e.oman”). The e.oman Annual Report for 2011 illustrates the progress of implementing the e.oman strategy, which is a national endeavor to improve the quality of life for the citizens and residents of Oman through improving the delivery of services. The Information Technology Authority is committed to the standards of Health, Safety and Environment, making them a fundamental in all activities related to transforming the Sultanate of Oman into a sustainable Knowledge Society. Due to the rapid development in Information and Communication Technologies, and its importance in the progress of Economic Growth. And as a result of the importance of statistics and indicators in reflecting the profile of ICT usage, and its key role in the development of national plan and projects. ITA has launched its first statistical publication for the surveys done during 2011: ICT Usage in Government Survey and ICT Access and Usage in Higher Education Survey. The Information Technology Authority (“ITA”) Annual Report for 2010 presents the achievements accomplished so far in the implementation of the National Strategy for Oman’s Digital Society (“e.oman”). The e.oman Annual Report for 2010 illustrates the progress of implementing the e.oman strategy, which is a national endeavor to improve the quality of life for the citizens and residents of Oman through improving the delivery of services. The year 2010 allowed ITA to reflect on ITA’s role and engagement of all stakeholders in bringing e.oman to fruition en route to Oman’s Economic Vision 2020. the response from government agencies, private sector establishments and civil sector organizations has been overwhelming. While the ITA could not have achieved this progress without the support of all the concerned parties, it is imperative to highlight the great efforts put forth and dedication demonstrated by ITA employees and Board members who have been pivotal to the success of e.oman. The Digital Oman Strategy/e.oman strategy outlines the blueprint for several key IT initiatives in the Sultanate of Oman which aim to empower the citizens by providing meaningful interaction through eServices. The e.oman strategy addresses eGovernment as well as Digital Society issues. It aims to create an effective government-community-citizen infrastructure that provides better public services to its people. Through eServices, the government seeks new and innovative ways to better engage and interact with citizens in the delivery of public service. Using the latest Information Technology solutions, citizens would be able to view information, pay bills, apply for services and monitor application status right in the comfort of their own homes, offices and from their mobile devices. Businesses could also reach out to the global marketplace and compete effectively and efficiently. The eServices would truly transform the way citizens interact and transact with the government. Continuation of the initiatives in raising awareness and encouraging use of Ministries Transactions Services , the Information Technology Authority (ITA) has launched recently (Guide for M-Government Services VIA SMS). In a matter of very few years, the Internet has consolidated itself as a very powerful medium that has changed the way we communicate and interact on both professional and personal levels. And with the increase of such traffic, there is an increased need to build a sustainable secured environment to ensure that all ICT users feel safe and secure using their PCs offline or while browsing the Internet. Such assurances will positively aid in achieving e.oman’s vision of transforming the Sultanate into a sustainable knowledge society. By providing a sense of security this will lead to an increase in the use of IT technologies within the Sultanate. There is no doubt that issues of information safety and security have become the most import tant pillars of the digital economy, to ensure the protection of scientific data, commercial and personal information from any abuse attempt or vandalism, and as well to ensure the safety and integrity of the information. Without information security we will lose the significance and usefulness of the global information society. Therefore, information security is extremely important due to the size of the growing threats which keep increasing day after day. OCERT (Oman National Computer Emergency Readiness Team) was established to face these challenges and to serve as the trusted focal point of contact for any ICT security incident in the Sultanate, focusing on cyber safety and security and, to serve all information technology users in Oman, whether from the government sector, private sector, or individuals. Sultan Qaboos Award for Excellence in eGovernment comes as reaffirmation of His Majesty’s vision to transform the sultanate and create a Knowledge Society in Oman. Information technology and communications have now become the main elements that move forward the development process in the Third Millennium, and the attention given by His Majesty – may God protect him – to create a national strategy to develop the Knowledge and skills of citizens in dealing with information technology is remarkable. This Award aspires to make a qualitative transformation in the field of eGovernment services by honoring digital projects that deliver exceptional innovations and achievements in the field of information technology. The Award aims also to appreciate excellent performance by applying international standards in evaluating the degree of development in eServices and supporting the strategy of e.oman as well as strengthening IT and Telecommunications in the field of economic, social and cultural development. The Award instigated in 2010 shall be managed and supervised annually under Information Technology Authority (ITA) patronage. All government institutions are eligible to participate in the award and compete For its prizes. This Award serves as recognition and appreciation for the institutions that use information Technology to enhance their performance and fulfill all the needs of the citizens, to save time, effort and cost in carrying out all the governmental transactions through eliminating inefficient and unnecessary practices And procedures, implementing the best suitable solutions to facilitate the attainment of services, developing The means of communicating and exchanging information within the government institutions and enhancing The quality of performance. The Electronic Transactions Law of the Sultanate of Oman has been issued by His Majesty’s Royal Decree 69/2008. The formulation of this law begins a new era for Oman, where a truly e-enabled society evolves in the realisation of the digital society of Sultanate. It is a major milestone in the implementation of the national IT strategy by the Information Technology Authority of Oman. This is the first law for legalising electronic transactions in Oman which can be defined as any contract, agreement or communication in this regard to be fully or partially implemented by electronic means as electronic messages. Realizing His Majesty’s grand vision of transforming Oman into a sustainable knowledge based society began with endorsing the Oman Digital Society Strategy in March 2003. In His address to Oman Council in November 2008, His Majesty stressed the need to develop the technological and practical skills of citizens and provide them with the resources and training required to enhance their capabilities and incentivize them to seek knowledge. His Majesty also directed the Government to simplify processes, adopt technology in its daily operation, and focus on electronic delivery of its services . The Cyber Crime Law of the Sultanate of Oman has been issued by His Majesty’s Royal Decree No 12/2011. The formulation of this law begins a new era for Oman, where a truly e-enabled society evolves in the realisation of the digital society of Sultanate. It is a major milestone in the implementation of the national IT strategy by the Information Technology Authority of Oman. Information Technology Authority (ITA) is set up by the Royal Decree 52/2006 promulgated on the 1st June 2006. This autonomous legal body affiliated to the Minister of National Economy. ITA serves as a competency center on best practices in e-Governance and in harnessing Information and Communication Technologies (ICT), thereby offering efficient and timely services, integrating processes and improving efficiency in service delivery. ITA undertakes several projects to increase technology penetration and empower its people with required digital literacy and higher levels of competence through training and innovation centers. Electronic copy of the e.Oman booklet . It includes a brief about national IT strategy to defined Information Technology Authority ITA , board of directors, national ITA vision and mission, plans and projects, frameworks and standards, means and end , Identity of e.Oman, and initiatives of e.Oman. Information Technology Authority provides advisory services to Government agencies and related entities in Oman. The advisory ervices are aimed at enhancing and optimizing IT resources for efficient delivery of citizen services and effective operation of the overnment. Services Catalogue is an integral component of the advisory framework and provides a clear description of the services and the roles and responsibilities of ITA and the service recipient. The Digital Oman Strategy or e.oman outlines the blueprint for several key IT initiatives in the ultanate of Oman which aim to empower the citizens by providing meaningful interaction through eServices. By addressing Government as well as Digital Society issues the e.oman strategy aims to reate an effective government-community-citizen infrastructure that provides better public services to its people, thereby reducing bureaucracy. Through implementing eServices, the government seeksnew and innovative ways to better engage and interact with citizens in the delivery of public service. Introduced as part of the national e-Governance initiative, the e-Purse, embedded on national ID and resident cards, is the first of its kind in the region. Implemented by the Royal Oman Police (ROP), in association with the Information Technology Authority (ITA) and BankMuscat, the national e-Purse project will revolutionise cash transactions. During the first phase of the project, the e-Purse can be loaded with cash only at BankMuscat branches, with the Point of Sale (PoS terminals) network of the bank facilitating card-based transactions at ROP directorates, ministries and government establishments. In the second phase, the customers will have it even easier - the e-Purse can be loaded with cash at other banks too. eOman Award 2009 winners ceremony was held under the auspices of HE. Khalid Hilal Al Busaidy, Secretary General, Council of Ministers at the Majan Hall, Al Bustan Palace Hotel along with the august presence of HE. Mohammed Nasser Al Khasibi, Secretary General, Ministry of National Economy and Chairman of the Information Technology Authority of Oman. The eOman Award is a recognition for creative digital services, products and solutions that have been implemented harnessing technology to enhance the e-culture of Oman. This annual award promotes Oman’s information society where all people create, receive and access information and knowledge to reap economic, social and cultural benefits. The eOman Award has been bench marked based on international and regional awards and is spearheaded by the Information Technology Authority of Oman. It aims to recognise distinguished performance in the delivery of electronic services from the governmental agencies that aspire to transform the community of the Sultanate of Oman into a sustainable knowledge society. Furthermore, the award strengthens inter-agency cooperation to bring about economic and social benefits through creative use of technology. Information Technology Authority e-Brochure include brief about National IT Strategy, Information Technology Authority, ITA Board, National IT Vision, Knowledge Society, eOman Initiatives, Digital Oman strategy, eOman Projects, ITA office contacts and Contact details. Speech of Dr. Salim bin Sultan Al Ruzaiqi – CEO of ITA on the occasion of World Information Society Day on 17th May 2008. Presentation by Oracle on 'Managing Database Environments'. Presentation by Oracle on "Oracle Database"
Electronic version of Information Technology Authority (ITA) brochures briefing the projects. Welcome address delivered by Eng. Ahmed bin Hassan al Dheeb, Under-Secretary at the Ministry of Commerce and Industry and member of the ITA board on the occasion of Oman-Singapore ICT Business Forum. Speech of Dr. Salim bin Sultan Al Ruzaiqi – CEO of ITA on the occasion of World Information Society Day on 19th May 2007. A field study prepared by the students of Sociology Department and Sociology work of the Sultan Qaboos University, covering the Governorate of Muscat, 2006. ITA seminar on the importance of implementing an Information Security Management System (ISMS) and overview of the ISO/IEC 27001 Standard for Government IT Managers held at the Institute of Public Administration on 7th April 2007, delivered by Chris Ferrant, BSI Management Systems. ITA conducted a seminar on Data Centre in association with Mideast Data Systems (MDS) and Hewlett Packard (HP). The event was held on March 27, 2007 at Crown Plaza with Dr. Salim Sultan Al Ruzaiqi, CEO of ITA as the chief guest and was attended by IT Directors and key professionals of public sector organizations.The opening address was delivered by Mr. Youssef Fawaz, IT Division Manager of Mideast Data Systems followed by a Mr. Mark Niblett, Technical Sales Manager of Anixter who delivered a presentation on the Design of Data Centers. As part of technical awareness sessions for COMEX 2007, ITA conducted a seminar on Data Centre in association with Mideast Data Systems (MDS) and Hewlett Packard (HP). Digital Oman Society Report has been prepared by the Information Technology Authority (ITA), Sultanate of Oman, to summarise the initiatives taken various government and non-government bodies of Oman, in harnessing Information and Communication Technologies (ICT) for overall progress of the nation within the year 2005-2006. It has been structured according to World Summit for Information Society – Plan of Action and its themes. A presentation by Mr. Bala Subramaniam, Certified Information Systems Security Professional, delivered during the Information Security Forum for public sector. A presentation by Alain Kallas, Certified Information Systems Security Professional and ISO 27001 Lead Auditor from Front Defense LLC, Dubai Internet City delivered during the ITA-MDS information security seminar. A presentation by Eng. Yaqoob Al-Bulushi DG at the Head Office of Muscat Municipality and supervisor of Information Systems Department on MM CRM that was delivered during the celebration of the 1st International Information Society Day, 2006. Speech of HE The Under Secretary for Development Affairs, Ministry of National Economy, Deputy Chairman Information Technology Executive Committee (ITEC) Sheik Alfadhel Al-Harthy at 'Making Connections in the Middle East' conference organized by ITTS in association with the USTDA. Opening speech of H.E. Mohammed Nasser Al-Khasibi on the launch of eOman awareness campaign; in Al Bustan Palace on 15 April 2006. A presentation prepared in cooperation with Gartner for the ITTS monthly awareness workshop on "Prioritizing e-Services"
Opening speech of (IT Governance Framework)workshop by head of ITTS, Dr. Salim Al-Ruzaiqi. This workshop was organized and conducted by the ITTS on 7th of February 2006 in Ministry of National Economy, Al Khuwair. A presentation prepared by ITTS to participate in the International Conference on Information Technology Security organized by Muscat Municipality over the period from 18 to 20 November 2005. Presented by Dr. Salim Al-Ruzaiqi, Head of ITTS. A presentation prepared by ITTS to create an awareness on the issue of Information Security and it includes an overview of information security, statistics, illustrations, facts and suggestions. A checklist that is intended for web server administrators to secure their web servers in an easy and systematic approach.